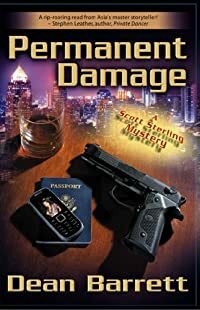 Permanent Damage by Dean Barrett, a Mysterious Review. Review: Ex-military expatriate Scott Sterling, now a private investigator in Bangkok, is hired by a woman to find her missing father, a man previously presumed dead from a combat mission during the Vietnam War, in Permanent Damage, the second mystery in this series by Dean Barrett. Captain Stuart Winters was with military intelligence during the war, and handled sensitive assignments within both Vietnam and neighboring Thailand, often part of a "sterile" team — "armed with deadly weapons but no documents, no ranks, uniforms made in Asia and completely untraceable." His daughter Kylie has obtained documents that suggest there may have been a cover-up, that her father didn't die on an undercover mission as officially reported, but may have been murdered, his current remains unknown. Despite the case being seriously cold — Winters was reported dead in 1971 — she wants Sterling to find out who killed him and why. Though the missing person murder mystery plotline is reasonably straight-forward (at least initially), Permanent Damage seems overly complicated right from the start. Part of the problem is the sheer number of government and military acronyms that are used; granted all are defined, but for the first few chapters it's hard to keep straight who's working for whom or who's on whose side. Then there are point of view issues (though to be fair, some of this may be intentional, plot-wise). Sterling tells his story in first person, with other current action as well as background and backstory told from the perspective of various third parties (one of which is on a parallel investigation to find Winters but for very different reasons). There isn't always a clean break between them and at times they overlap. Still, readers who are willing to overlook these issues will be rewarded with an action-packed thriller that has some surprising plot twists and includes a lot of local Thai color. Acknowledgment: Dean Barrett provided a copy of Permanent Damage for this review.